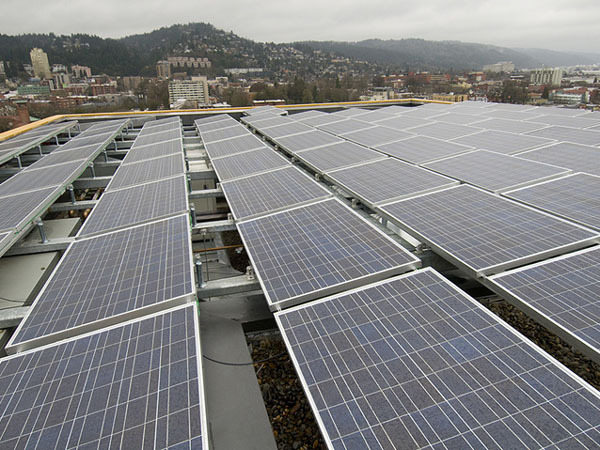 These are the photovoltaic (PV) panels on top of Portland’s Casey Condominiums, the nation’s first residential building to achieve a LEED Platinum rating. It looks like a lot of PV, but it actually only expected to provide about 2.5% of the building’s total energy use. The 23 kW of panels cover roughly 2,300 square feet, and the PV Watts calculator estimates that they would produce about 24,000 kWh per year in Portland — that’s a little more than two typical U.S. households (11,000 kWh/year). Overall, the Casey is expected to consume half the energy of a code-compliant building, which means there’s a lot more going on to reduce energy use than just the just PV. The negative impact of an envelope comprised of about 50% window openings was minimized with the use of high-performance, low-e coated glazing. HVAC is a water-source heat pump system that is designed to move heat from warmer to cooler units when temperature differentials exist. The HVAC system also exchanges heat with the domestic hot water system to reduce energy use in both systems. The units and the trash room are equipped with a heat recovery ventilation systems that use the heat in exhausted air to heat incoming air. And of course all the lighting and appliances are the most efficient available. The Casey, developed by Portland-based Gerding Edlen and completed in 2007, is easily a more advanced residential high-rise than anything yet built in Seattle. Sorry Mosler Lofts, 5th and Madison, and Olive8. And it may well be that Gerding Edlen’s Bellevue Towers is destined to lead the current pack in the Puget Sound region. 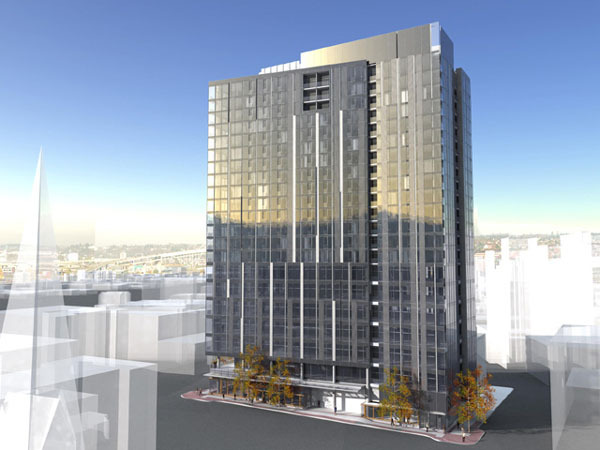 Oh, and Gerding Edlin has a followup to the Casey in the works: a 22-story office/residential tower at 12th and Washington (rendering below) that will incorporate solar hot water and wind turbines. Who is Seattle’s Gerding Edlin? Posted by dan bertolet on	Tuesday, January 6th, 2009 at 12:28 am. You can follow any responses to this entry through the RSS 2.0 feed. You can leave a response, or trackback from your own site. Damn you Portland. You just had to be one step ahead of us. You have to ask, though: is PV really worth it if it only reduces energy by 2.5%? Not very much bang for the buck there. PV still has around a 20-30 year payback, but it does pay back. But yes, I recommend PV as a final step. After you’ve designed an efficient building envelope, after you’ve added daylight dimming systems, high efficiency lighting, an efficient heating system, an efficient or even non-existent cooling system, and after you’re out of reasonable efficiency measures: then go for PV. It’s much cheaper to not use energy than to generate your own. The fact that they installed PV probably means they felt they were close to this point. What type of PV system did they select? I dunno, kind of seems like a waste of money — what if the same money had been spent on buying better insulation or new windows for low income families in older housing elsewhere? Seems like it would have a much better overall impact on the environment. Oh, but I guess then people couldn’t show off the solar panels to their guests. PV Watts link fixed (enter 23kW). And this is worth remembering: you can supply the entire annual energy needs of one average U.S. household with about 1000 sf of PV in not so sunny Portland. There are lots of single-family homes out there with roofs big enough to hold 1000sf of PV or close to it. All that said, you can definitely get more energy bang for you buck other ways, and that’s probably why the 12th and Washington project has solar hot water instead of PV. Why does everyone in Seattle always act like Portland is this city made of gold and we would be so much better if we could just be like them? Have some confidence in yourself Seattle. Don’t be such whiners. Should we strive to be better and improve upon our architecture and sustainability? Absolutely. Lets do things our way and point out what we do best once in awhile. How about posting what makes Seattle a better place than Portland or Vancouver? If Portland is such an amazing place then what are we doing living here? I totally agree, Michael. Why do we whine so much? I bet they don’t whine in Portland. I bet in Portland everyone is so cool they don’t even publicly acknowledge Seattle. Damn you, Portland! Michael, have you been to Portland? Aside from the blunderous development of the Pearl and the downtown southend they have been very good at developing their midrise housing especially around commercial cores. I am amazed at Portland’s balance between high, mid and low density, their establishment and support of eastside neighborhoods that you can walk between, and their devotion to raising the bar on sustainable design. Sure they are not perfect but other than the Pearl and Southside they don’t seem to be in the development game to make tons of money while building the schlock like we do so well up here. “Who is Seattle’s Gerding Edlen?” That’s a very good question that I’ve been asking variations of for a while now on my blog (http://www.djc.com/blogs/BuildingGreen/?s=gerding+edlen). It’s not only that Gerding Edlen is a green developer… which we do have here in Seattle. It’s also the level of emphasis they put on green building. For example, Gerding Edlen dedicates part of their annual budget towards research and figuring out solutions to the problems that plague the green building industry. Locally…. I haven’t yet found a developer that does the same. (Though other professions do… for example, Arup though that’s on an international scale.) However Gerding Edlen is often candid about the profit it makes off of its green projects… so it would be interesting to ask them how that research budget is being affected by the current state of the economy. Great post! Hmm. Having lived in Portland I can hardly call it utopia. Compared to the other places I’ve lived, I see very little cultural difference between Portland and Seattle. The competition is healthy and pushes both cities toward sustainability faster than if we were always comparing ourselves to LA or Dallas. Yeah, this Portland envy is sort of weird. I can’t figure the comment about mixing high/mid/low – there’s very little residential “high” in Portland, outside of the Pearl and South Waterfront Disneylands, that is much newer than our old stock (i.e. from the 60s/70s). If anything Portland has been more sluggish in adopting zoning for density around MAX stations than some of its own suburbs. I mean, wouldn’t people generally agree that it’s odd that a central city is lower density than about half of its major suburbs? Of course, it has also been more sluggish in adopting the car culture that marks much of the other development in those suburbs, so eh. Now this is the sort of stuff we need to see more often. However, I wonder about the issue of light density of light in Portland since this is suppose to be one of those cities that comes in with less than average sunlight. Chocolate cover grasshopper and it was really good. whoa!, this is a really good post. I remember about reading something similar to this once, this is very great article.